The first half of Caterpillar’s second year was pretty great – he was changing loads and his speech started to develop very quickly and tantrum wise, he wasn’t too bad at all. Then he hit two and a half and things really changed! Whining, tantrums, demands, attitude and refusing to follow direction. The ‘terrible twos’ had descended. Thankfully, his awesome sense of humour and exploding vocabulary goes a long way to make up for it but I still find challenging behaviour tricky to manage, both actually and emotionally. Frankly, I’m sick of hearing my own moaning and shouting, and it’s not fun for either of us. I figured there must be another way, a way I could be more positive as a parent, and I started to consider reward charts. We used a sticker chart to potty train Caterpillar last summer and it worked like a dream. He adored being rewarded and responded brilliantly so I figured it was worth a try to encourage other behaviours too. 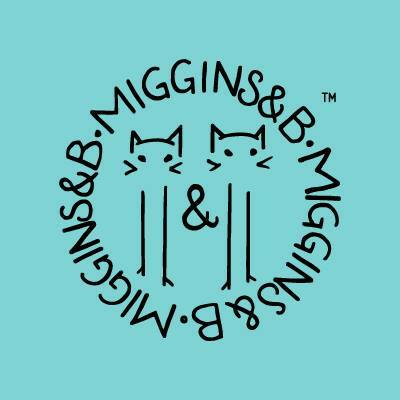 I looked online and discovered Miggins & B. 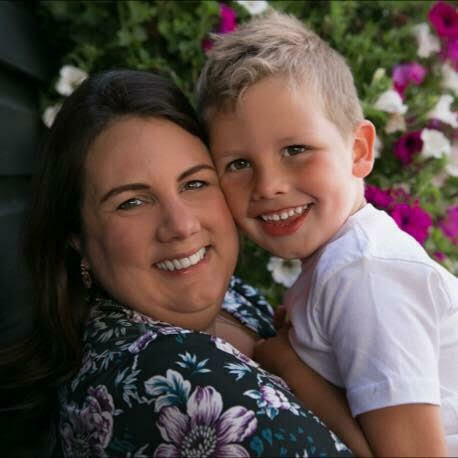 They are a family company who began selling a range of high quality and unique reward charts after designing charts for their own kids. 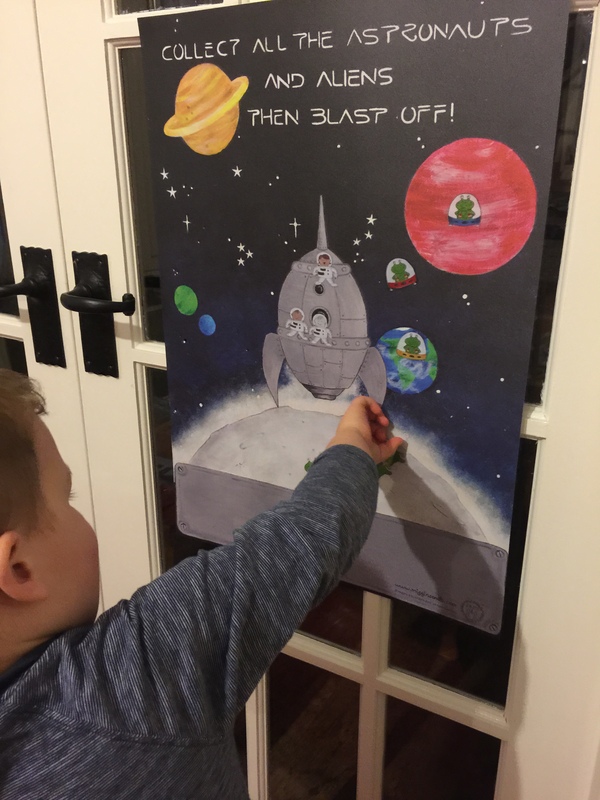 Most charts I’d seen previously were based on a grid system with star stickers and tick boxes etc but what attracted me to Miggins & B’s charts are that they are based on a themed image, your child collects stickers that match that theme and they can stick them wherever they want. Once they have a certain amount they get the main “prize” sticker which you can then exchange for an actual reward of your choosing. 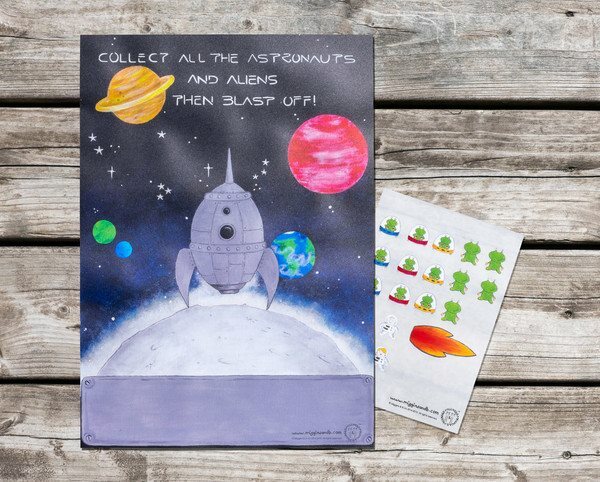 There are six different charts to choose from, and since Caterpillar really loves space and aliens at the moment I went for the Blast Off! theme. The charts are a really lovely quality, A2 size and made from wipe clean PVC, with reusable stickers. Plus the images are lovely. They come beautifully packed too and with helpful instructions on how to get the most out of the concept. Miggins & B recommend tackling one area of behaviour at the time which makes a lot of sense so we decided to start with mealtimes. In the last year or so Caterpillar had begun to get a little fussier at mealtimes. He used to eat everything but he was starting to refuse and fuss, get down from the table and make excuses etc. I knew it was definitely behaviour rather than a matter of taste as he would refuse the same meal one day and then eat it all up the next! I had been encouraging him to eat his dinner with the offer of dessert but I wanted to try a different approach and the chart seemed like a good plan. I had wondered if at two years ten months Caterpillar might be a little young so I was really pleased when he understood and was engaged straight away. From the moment I got the chart out of the box and stuck to the wall he was keen to get involved. The first night was a little challenging as I think the sheer excitement of getting a “special sticker” got him too distracted to eat so we had a bit of a battle. But eventually he ate everything and claimed his reward. Every night since has been much improved. He still sometimes tries to refuse but when I remind him that he will get a sticker if he eats it all he quickly agrees. I’ve always tried to be relaxed about his eating, if he doesn’t eat something I don’t force him but I explain that he won’t get anything else so this reward system suits us well because it enables us to use something positive to encourage him to eat. Seeing his excitement about it has been lovely and he even shows off his chart and stickers to visitors. He’s even more interested in getting his sticker than getting his dessert now which is a real shock! Once he achieves all his stickers and gets his reward I may move onto a different area of behaviour which will probably be a little tougher but I feel very encouraged by the response so far. And at the moment, it gives me one less thing to stress and shout about which is a bonus for me. Are you in the midst of the ‘terrible twos’ or do you have a difficult ‘threenager’? If you’re considering a reward chart, Miggins & B are a really fantastic option. You can buy yours here. Disclosure: I received the Blast Off! reward chart from Miggins & B in exchange for an honest review. Content and opinions are all my own. Aaah, these look fabulous! I love the concept! We currently a threenager refusing to be potty trained, and in the worst throes of threenagerdom, and a toddler with possibly award winning perpetual displays of terrible twos. By the end of every day at the moment, I’m an actual wreck… I made a star chart for the potty training, but it got ripped up in total disgust. I will give one of these a go! I love the sound of this! My little boy is going through a super whiney / tantrum stage, but I wonder whether he’s too young to really understand something like this. I think definitely for when he’s a little bit older though! I love the look of these charts! I think I may have to invest. My little lady has always been a sucker for a sticker but we haven’t bothered with charts up to now as the whole grid thing puts me off a bit but these look really fun and engaging. I love positive rewards for good behaviour. Currently dealing with a v angry (at times) four year old! We dealt with a phase of bad behaviour some time ago with ‘praising the positive’ and it worked an absolute dream…maybe we need to revisit that approach! Thanks for sharing with #coolmumclub, looks like a lovely product.